I started work on the elevators tonight. I have the rudder parts ready for priming, so I tucked it away on the shelf to get the elevator to the priming stage then I will do them together to save time. 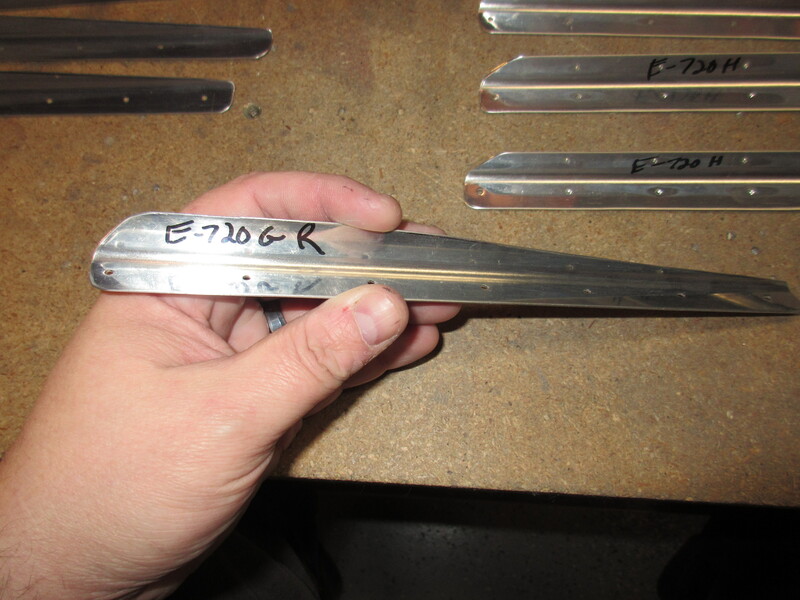 Like the rudder, the elevators use stiffeners that have to be cut and shaped from stock aluminum angle and then back riveted to the skins. Van’s has done a great job on pre-punching the aluminum angle stock that you use for the stiffeners and they even include punch marks to show where to trim each stiffener. There really isn’t much to discuss on creating stiffeners, you simple use the aircraft snips and trim the angle at the marks and then round off all the corners with a file. There are quite a few of these buggers, but they go pretty quickly. Once you have them trimmed out of the stock, we have trim an angle down to the trailing edge to make room for the narrowing gap where the skins for the trailing edge. This is marked, so I just connected the punch marks with a sharpie line, and trimmed it out with my snips. Then we snip down the leading edge of the stiffener for a bit of clearance, but not as a drastic a cut as the trailing edges. The photo above shows a finished stiffener. Once they are all trimmed out, I ran each one across the scotchbrite wheel to clean up all the edges and they are ready to be dimpled and riveted on to the skins. Thats about it for tonight, these things took me about 3 hours to trim out, shape, and clean up. But, both sides are done and ready to be match drilled, then dimpled, then riveted onto both skins. Thats work for another session! Tagged Stiffeners, Right Elevator, Left Elevator. Bookmark the permalink.